Tons of high schoolers toured the lab in March. 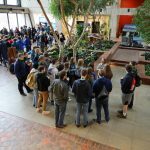 On March 20, the atrium was FULL of students at 10 a.m.
From Daily Herald, April 8, 2019: On Wednesday, April 17, from 5:30 to 8:30 p.m., Fermilab will offer high school students a valuable opportunity to ask those questions in person. The annual STEM Career Expo, held in the atrium of Wilson Hall, will put those students face to face with people actually doing the jobs they will be applying for in the coming years. Last year, rising high school senior Ketandu Chiedu from Walter Payton College Prep spent her six-week TARGET internship in the Fermilab Office of Communication. Working with her supervisor, Lauren Biron, she interviewed scientists working on the Fermilab-hosted Deep Underground Neutrino Experiment as part of the Faces of DUNE series. 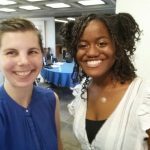 Mentor and mentee met up recently to discuss the internship program and what the future holds. University of Cincinnati students are given a tour of SiDet. The bubble chamber is always a “must have picture by it” opportunity. It’s massive, it’s cool, and who wouldn’t want their picture by this giant, science lawn ornament? Bob Shaw of the Education and Public Outreach Office, at left, brought these students. Stephanie Timpone of the Particle Physics Division led the tour. If you know kids between the ages of 7 and 12, you know how hard it can be to get them excited about science from a textbook. Children love to be wowed and to experience physical phenomena with eyes wide and jaws dropped. 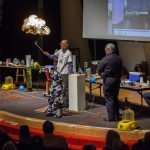 That’s the thinking behind Fermilab’s annual Wonders of Science show, which will take place on Sunday, March 10, at 1 p.m. The show, organized and performed by award-winning high school teachers, is celebrating its 32nd year at Fermilab. Tickets are $5.00 per person. 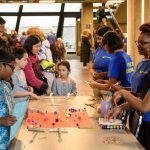 On Sunday, Feb. 10, an incredible 2,500 people turned out for Fermilab’s 2019 Family Open House. 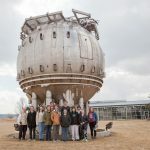 This year’s event featured an exhibit commemorating Leon Lederman, The Great Neutrino Hunt, and a livecast with experts underground at Sanford Lab. Look at the photos to see people having a good time learning about science.